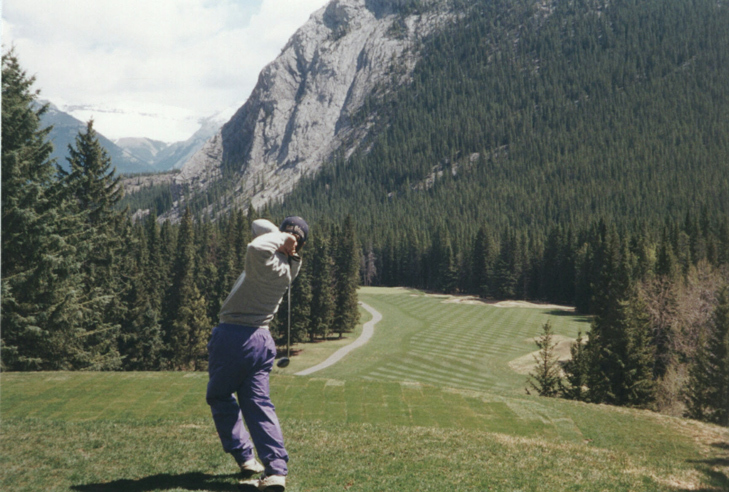 Banff Springs Hole 2 (right): The first par three on the golf course is mentioned mostly for the view; Mt. 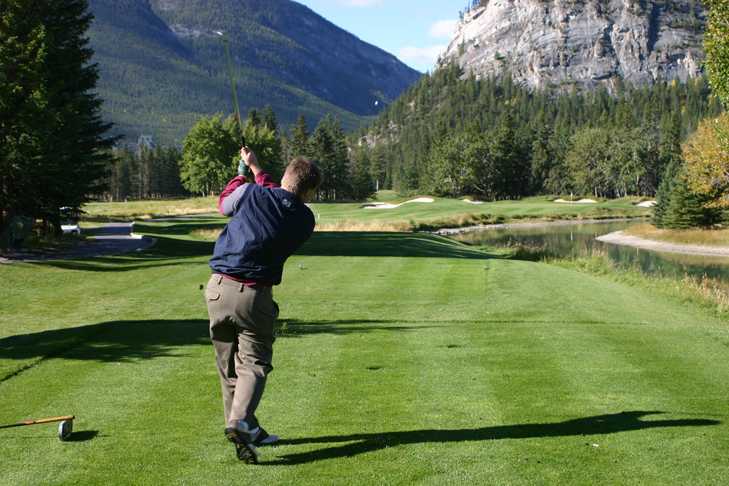 Rundle is situated squarely behind the green, making distances and depth-perception quite skewed, but pleasantly so. There is great bunkering around the green, but a generally decent golf shot will not find much trouble. Banff Springs Hole 4 (below): Considered by golf architecture gurus to be one of the very best holes in all of the world, “Devil’s Cauldron” is a very beautiful par 3. Well downhill and with Mt. Rundle directly in the background, the tee shot must be played over a natural glacial lake to a green surrounded by 6 sand traps (or the less famous, but more treacherous alternate green cut close to the lake well right of the original as seen in this picture). 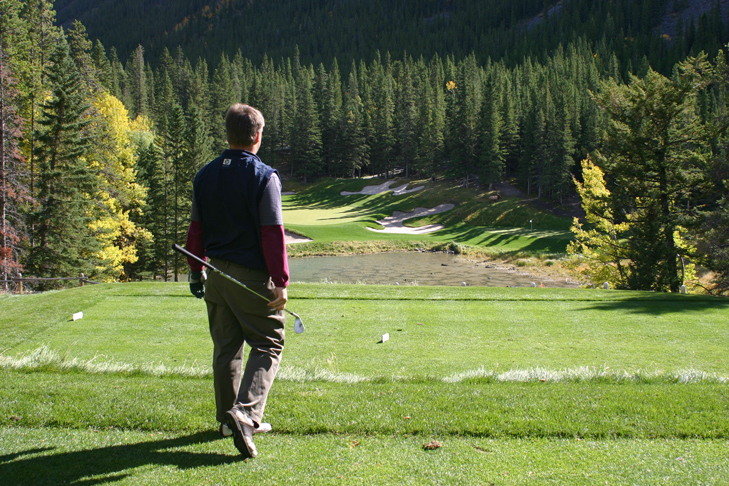 The distance is very difficult to judge, but just watching the ball flight from the tee is one of the most serene moments any golfer will ever enjoy, at least until it lands. Banff Springs Hole 10: Another solid, long par 3, this long one-shotter must be played over a bend in the beautiful "little" Bow River tributary. Anything right or too short will find it, and the golfer who is too cautious will find bunkers or long grass and mounds left of the green that will make up and down quite challenging. Banff Springs Hole 14: A tough uphill par 4 with the Banff Springs Hotel looming on a hill in the background and the Bow River on the right side (although not much in play). The real treat here is that there are 18 bunkers on this hole, so avoiding them is a victory in itself. As a side note, this is the first golf hole that the author ever hit a golf ball on, with a 7 iron at age 7. Is it any wonder golf is my sporting passion? Banff Springs Hole 15: Just a purely beautiful par four in every sense. 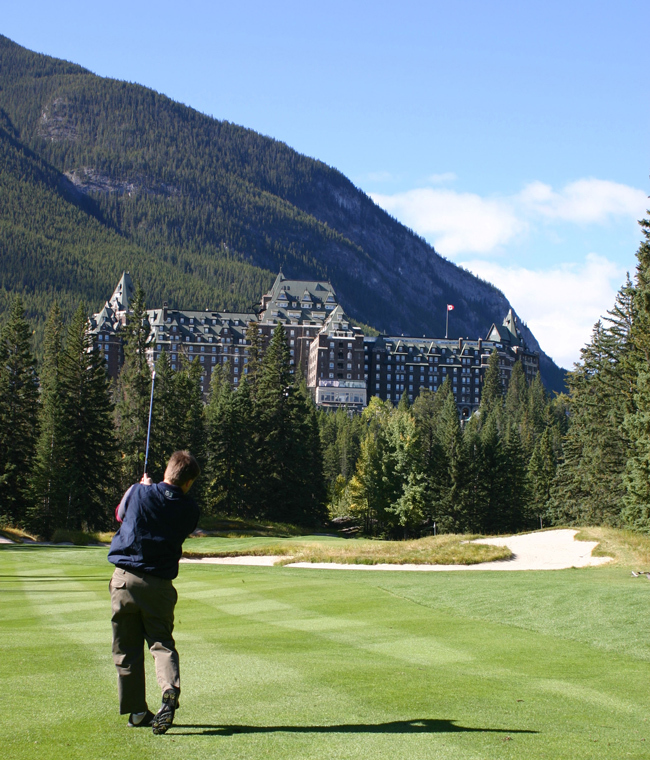 A well struck shot from the elevated tee over the Bow River and under the shadow of the Banff Springs Hotel will hang in the air against the forested backdrop of Mt. Rundle for a long, long time. The distance on the drive can also be mammoth in the high-altitude air. The approach shot is challenging as 6 bunkers surround the green. As a side note, this used to be the first hole on the course and usually had many spectators (talk about a nerve-wracking start to a round).